With webOS 2.0 on board and an easy-to-use pointer remote control, this is smart TV how it's meant to be: fast and intelligent. Bold design, punchy colours and and bright image make the LG UF950V a great 4K TV. If you're in the market for a striking new TV then the only way to go is 4K. We're on the cusp of an ultra-high definition future, but lack of compatibility and content has been the biggest problem. Until now. The LG UF950V, the company's flagship 4K-er (save for the ultra-massive UB980V models), supports the latest codecs - both HEVC and VP9 - so streaming YouTube in 4K, or getting the latest and greatest 4K Netflix content on the big screen is possible. We've been watching 4K GoPro clips on YouTube for the very first time on this TV. With 4K Blu-ray also just around the corner - it's due summer 2015 - the final hurdle to clear is 4K broadcast content. Whenever that happens the latest tellies will need to be what's known as HDCP 2.2 compliant. The UF950V ticks that box too, as confirmed by LG, so the UF950V is future-proof. With so many ticks in so many boxes, can the LG UF950V do no wrong? We've had a 55-inch one on test for three full weeks, putting it through its paces to find out. If you want flagship 4K then you've got to pay for it, that much is clear. The UF950V in its 55-inch form is £2,599. Jump to 65-inches and you'll need an extra grand to cover the £3,599 price tag. It might not be budget, but it is one good-looking TV. With a single footstand the large silver-lipped panel looks as though it's floating above, the image encapsulated in a 13mm outer bezel (on the 55-inch model's top and sides anyway). Even the subtle LG logo to the slightly larger bottom edge isn't illuminated to avoid potential distractions when viewing. That stand isn't just there to look pretty either. Called an "auditorium" stand, it's designed to deflect sound forward and keep things sounding as grand as possible from the built-in 4.1 Harmon Kardon system. We didn't actually know that was the case until we did some additional pre-write-up research, by which point we already thought the sound quality was exceptional - booming and clear at all volume levels, meaning no desperate need for a separate soundbar. The main panel is slim too, measuring just 9mm deep. However, as all the ports and on-board processor require extra space, the 26-40mm of additional depth makes for a 49mm total by our measurements - something to consider if you're going to buy the wall-mount bracket and were hoping for it to be flush to the wall. On the rear the panel is backed in a white plastic, which doesn't look as altogether premium as the black and silver of the front. But hey, this is the back we're talking about, so it's of little consequence. There are a host of ports too: four HDMI (two are 2.0 for 4K), three USB (one is 3.0 for faster transfer speeds), LAN for connecting to a router (Wi-Fi is also built in), even RS-232S and composite options for connecting older devices. Built-in Freeview HD can be received from the two LNB satellite/cable ports, or standard antenna, with on-board recording functionality possible if you have a separate HDD recorder. All this and that's before even turning the TV on. When you do you'll first be met by Bean Bird, the cartoony setup character who leads the webOS setup that makes the UF950V so easy to use. Now in version 2.0, webOS is quicker and better than before. And unlike Clippy - the irritating Microsoft Office paperclip from back in the day - Bean Bird remains elusive thereafter, only appearing in help sections, allowing you to get on with what you want without interruptions. If you've been following smart TV updates over the years you'll note that most earlier interfaces have been a lot of unnecessary faff. webOS 2.0 cuts through the unnecessaries, presenting a colourful overlay bar of shortcut tabs after pressing the included remote control's Home button. These apps can be rearranged, added and removed as needed by using the included remote. Active apps remain open in a tab too, so you can toggle between them using the remote without needing to close them down fully and wait around for re-loading. This is smart TV how it's supposed to be. The remote also functions as a pointer, a bit like those red-dot laser pens, with a virtual pink-peach coloured arrow appearing on the screen. You can quickly glide around the screen by pointing the remote, while the control's rotational wheel will ok selections, or can be used scroll up and down through selections. It works really well, but the position towards the lower centre is far too low down for natural use - you'll automatically be pressing the Home button like it's the "ok" button, when that's not the case. A small redesign is required here in our view. For our personal experience we've moved our Freesat box front up front in the webOS tabs, alongside BBC iPlayer, HDMI 2 (for PlayStation 4 - we can't rename it, though, which is a shame), Now TV, Netflix and YouTube. There are plenty of other apps available from the LG content store, broken down by Apps & Games, 3D, Premium (essentially all the go-to stuff, like Amazon), Movies (which seem to be hosted on Wakuai.tv rather than a variety of apps), and My Page (all your downloaded apps). It's not got everything though: no All 4, no ITV Player, and likely some other absences in the UK (and probably outside of it) present a few gaps. But then you've probably got a set-top box to cover those bases anyway. If you don't have a set-top box then the UF950V can still cover your back. We've setup dual LNB inputs for Freeview, which works fine but does find a bunch of worthless channels and everything is arranged in a weird order. You can pick out favourites, which then stick to a My Programmes tab on the webOS Home panel. Or, to simplify things, there's a Programmes setup section within advanced controls to pick out your core channels. We've been using the LG UF950V for weeks, so it's seen late night movies in a blacked-out room, daylight streaming through the windows when watching some early evening telly, in among hours of gaming (The Witcher 3 has effectively become our new life), app streams, and file playback. And it's not properly struggled with anything. Thanks to a phosphor layer the panel can display bright colours, but things don't appear over the top - you know, those explosive reds that are so pushed they stick out like a sore thumb. It's not the company's much touted Quantum Dot technology, however, which is reserved for the yet pricier TVs in the range. Black levels tend to be good, but as an LED-backlit LCD panel, it's not perfect. Those white-on-black scenes will see bleed from the backlight, but rather than it prominently showing from the corners as with many other LED LCD tellies, the UF950V can show a much larger wash of light. That's it's biggest issue of note. As an IPS panel, however, the viewing angles are good - so you needn't sit directly in front for the premier experience. Not that you'd want to sit sideways on any TV, but there's some leeway. For native 4K content, watching GoPro Hero 4 clips on YouTube is something magical at this 55-inch scale, which is exactly what this TV is all about. Breaking Bad and House of Cards on Netflix are other go-to 4K staples, each benefitting from superb cinematography to make a captivating experience. Everything appears so sharp. Upscaling is handled well too. Sure, SD content from those back-of-the-stack broadcast channels comes laden with artefacts, but source good content and things look great. We've been watching Game of Thrones via Blu-ray, which looks all the more stunning from its Full HD source. Gaming from a 1080p source looks great, and input lag is well handled too - not "Sony fast" perhaps, but quick enough to rectify any issues with some LG sets of old. As with all flagship TVs, some processing settings can be to the detriment of viewing certain material. 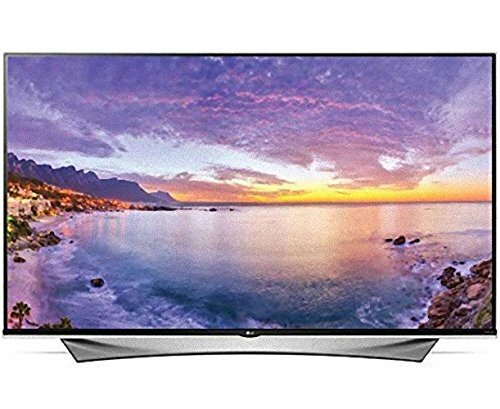 This is why LG delivers a bundle of additional picture, sound and advanced options in the UF950V, much like those found in competitors' TVs. It's all about the processing - that's how the picture is presented in any given form. The Picture settings on board comprise Vivid, Standard, Eco, Cinema, Sports, Game, Photo, ISF Expert 1 and 2 presets, with clear distinction between each. We thought Cinema was a little soft overall, but as each of these presets can be customised in the Advanced panel so that's not necessarily a problem. And there are oh so many advanced options. Perhaps too many for those who just want to watch TV. But for the tinkering geek there's everything here. From aspect ratio, backlight intensity, contrast, brightness, vertical and horizontal sharpness adjustment, colour, tint, through to gamma, dynamic colour and contrast (which optimise an image in real-time for contrast and saturation), and colour gamut (wide or standard) for those feeling even more adventurous. Whew. That may all sound like a list of nothingness if you're not interested in menu digging, but there are clear benefits to being able to take control of processing. If movies' protagonists look like they're gliding around the screen, for example, then you'll want to turn TruMotion's smoothing effect off (it's available in Smooth, Clear, Clear Plus and User options) to put things right. Similar to Picture settings, sound can be tinkered with too. There are preset modes (Standard, Cinema, News, Sports, Music, Game), but not separate frequency equalisation. Other settings include sync adjustment and audio type output, useful for those connecting to a receiver and separate surround system. Bold design, punchy colours and a bright image make the LG UF950V a great 4K TV. It's not got perfect blacks all of the time due to the backlight, though, which for the £2,599 price tag you might be expecting. But that's not enough to knock it down from being heartily recommended. With webOS 2.0 on board and an easy-to-use pointer remote control, this is smart TV how it's meant to be: fast and intelligent. Some apps are absent, but additions can be added in the future - that comes down to the providers really. Besides, the important ones are here: whether watching YouTube in true 4K (thanks to VP9 codec compatibility) or Netflix also in 4K (thanks to HEVC codec compatibility), this LG has more bases covered than previous models. The LG UF950V looks good when off, it looks great when on, all while sounding glorious thanks to the built-in Harmon Kardon speaker system. Finally 4K TVs are reaching a point where they're future-proofed and, therefore, well worth investing in (although invest is the word), particularly with the increasing amounts of available content.